Background: The use of smartphones has increased exponentially. Excessive usage of smartphones has been shown to have a negative impact on ocular health. 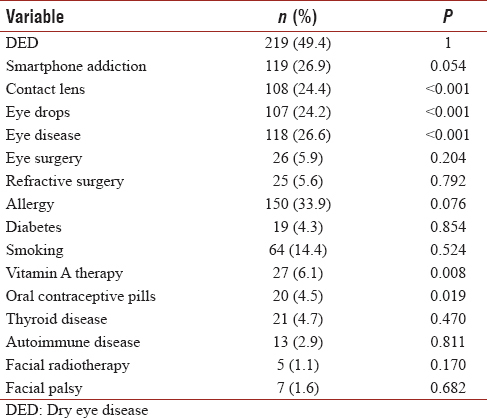 This study aimed to evaluate the relationship between smartphone addiction and dry eye disease (DED) and determine the risk factors of DED in participants associated with smartphone addiction. Materials and Methods: This cross-sectional study was conducted in May 2017. Participants were selected from the Faculty of Medicine at King Abdulaziz University in Jeddah, Saudi Arabia. Stratified random sampling technique was used to recruit participants according to their academic year with an equal allocation of males and females. Only participants owning smartphones were included in the study. DED was assessed using the ocular surface disease index (OSDI) questionnaire and a short-version of the smartphone addiction scale (SAS-SV) was used to assess smartphone addiction among the participants. Data were analyzed using Pearson's Chi-squared test and binary logistic regression. Results: A total of 443 completed questionnaires were received, providing a response rate of 94%. Almost half of the participants were found to have DED (49.4%). There was no significant association between smartphone addiction and DED (P = 0.102). However, significant associations were observed between DED and contact lens use, eye drops, eye disease, and Vitamin A therapy (P < 0.05). Conclusion: Contrary to what was locally reported, DED had a lower prevalence. Despite no significant correlation with smartphone addiction, DED was found to be associated with the use of contact lenses, Vitamin A therapy, and eye drops. Several risk factors and clinical predictors of DED might exist, which highlight the importance of performing a complete clinical ophthalmological assessment. The term “addiction” was in the past limited to drugs or substances; currently, it is also applied to other modern activities including gambling, the Internet, video games, mobile phone usage, and other behavioral addictions., A 2016 online survey conducted in Riyadh found that 76% of participants showed moderate-to-high risk of smartphone and Internet addiction. Similarly, a Korean study showed a high percentage of moderate-to-high smartphone addiction among university students. With the rapid growth of the number of smartphone users, there have been concerns regarding the negative repercussions of these devices. Dry eye disease (DED) is one of the most commonly encountered morbidities in ophthalmic clinics, making it a growing health problem. According to the International Dry Eye Workshop in 2007, DED can be defined as a multifactorial disease of the tears and ocular surface which consequently results in symptoms of discomfort, visual disturbance, and tear film instability with potential damage to the ocular surface. The prevalence of DED is increasing with variable estimations according to different populations. The Beaver Dam population-based study found the prevalence rate of DED in adults over the age of 48 to be 14%. Recently published data found DED to be highly prevalent in Saudi Arabia. However, local epidemiological data regarding DED are still lacking. There are many predictors for DED such as autoimmune, psychiatric, and endocrine disorders. In addition, medications including antihistamines, antidepressants, and antibenign prostatic hyperplasia medications also play a role in the disease. In addition, environmental and occupational factors were found in previous studies to contribute to DED., Multiple studies have shown that prolonged use of smartphones may adversely affect ocular health.,, A study focusing primarily on the adolescent age group found that extended smartphone use increased the rates of ocular symptoms, including eye dryness. However, there is a paucity of data on DED and its association with smartphones, particularly in Saudi Arabia. The goal of this study was to evaluate the prevalence of DED and its associated risk factors and to evaluate the relationship between smartphone addiction and DED. The findings of this study are of great value for future local updates in further management and risk assessment for smartphone users. This cross-sectional study was conducted in May 2017. The standard formula was used to calculate sample size. Since no recent accurate data were available, the prevalence was taken at 50%, with a 95% confidence interval (CI) and 5% marginal error. Participants were selected from the Faculty of Medicine at King Abdulaziz University in Jeddah, Saudi Arabia. The stratified random sampling technique was used to recruit participants according to their academic year with equal allocation. Males and females were distributed equally among the same strata. All participants owning smartphones were included in the study. The Smartphone Addiction Scale-Short Version (SAS-SV), which was initially developed from an older version called SAS, was used to assess the participants addiction to smartphones. It consists of 10 questions that are based on a self-reporting system using a 6-point Likert scale (1: “strongly disagree” and 6: “strongly agree”). It was used in our study to classify the participants into either addicts or nonaddicts according to their scores. A cutoff value of 31 and 33 was reported for males and females, respectively. DED was assessed using the Ocular Surface Disease Index (OSDI). The OSDI is a 12-item questionnaire designed to assess symptoms consistent with DED. The 12 items of the questionnaire were graded, using a self-reporting system, from 0 to 4 (0: “none of the time” and 4: “all of the time”). The total OSDI score was then calculated based on the following formula: ([sum of scores for all answered questions] × 100)/([total number of answered questions] × 4). Participants were then classified into four categories based on their total score: normal (scores: 0–12), mild dry eye (13–22), moderate dry eye (23–32), and severe dry eye (33–100). Socio-demographic data were obtained, such as age, gender, place of residence, marital status, income level, number of family members, academic year, and grade point average. 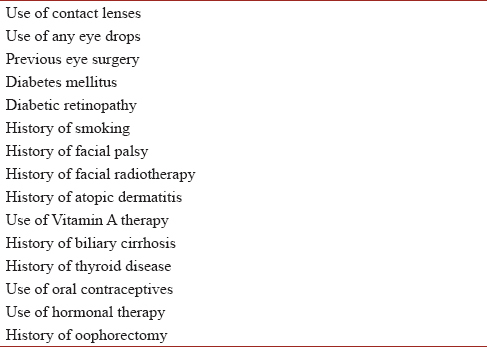 Risk factors for DED, which were extracted from a previously published study, were obtained as well [Table 1]. An informed, written consent was obtained from all participants. The study was approved by the local Institutional Review Board of King Abdulaziz University before conducting the survey. Descriptive statistics were used to describe the different variables in the study. Mean and standard deviations were reported for continuous variables. Frequencies (n) with proportions (%) were reported for categorical variables. The Pearson's chi-squared test was used to identify significant risk factors for developing DED at bivariate level. A binary logistic regression model with DED (yes/no) as the dependent variable was performed using the enter method to identify the significant risk factors. Potential risk factors that showed significant association with DED at bivariate levels as well as smartphone addiction were used as predictors in the model. The Omnibus test of model coefficients showed that the multivariate logistic regression models were statistically significant. The case-wise plot was not produced because no outliers were found and no multicollinearity detected (variance inflation factor < 3). All statistical analyses were performed using Statistical Package for Social Science (SPSS) version 23 (IBM, Armonk, NY, USA) at a significant level of 0.05. A total of 443 completed questionnaires were received, providing a response rate of 94%. There was an almost equal distribution of our sample by gender, with 225 males (50.8%). The mean age was 21.7 (range: 19–29 years). 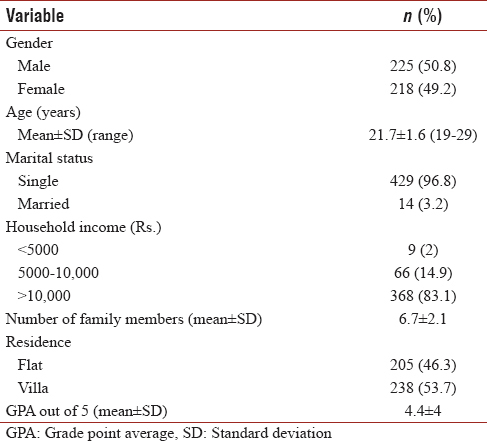 [Table 2] shows the sociodemographic features of the participants. Almost half of the participants were found to have DED (49.4%). [Table 3] demonstrates a significant correlation between DED and the use of contact lenses, the use of eye drops, preexisting eye disease, Vitamin A therapy and the use of oral contraceptive pills at bivariate level (P < 0.05). However, following adjustments, the logistic regression model revealed that there was no significant association between DED and smartphone addiction (odds ratio (OR) = 0.69, 95% CI: 0.44–1.1, P = 0.102) and the use of oral contraceptive pills (OR = 2.64, 95% CI: 0.88–7.93, P = 0.085) [Table 3]. On the other hand, significant associations were observed between DED and contact lens use, eye drops use, preexisting eye disease, and Vitamin A therapy [Table 4]. In this study, the prevalence of DED was 49.4% which is considerably lower in comparison to a previous study conducted by Bukhari et al., where the prevalence of DED was 93.2%. One reason for this disparity is the reliance on questionnaires alone without the use of clinical ophthalmic assessments such as tear films and slit-lamp examinations. Furthermore, our sample was comprised university students only and did not encompass other age groups such as the elderly. After adjusting for confounders, our study found that there was no significant association between DED and smartphone addiction; a finding similarly found in two prior studies., After reviewing the literature, a few studies showed that longer smartphone use per day was associated with the occurrence of ocular symptoms and a higher prevalence of DED., This discrepancy can be attributed to the fact that our study relied on the SAS-SV for the assessment of smartphone addiction and did not specify the exact duration of smartphone use per day nor the cumulative lifetime exposure (daily use duration [h/day] × years of use in lifetime hours). This study also investigated other potential risk factors for DED excerpted from previously published studies, including the use of contact lenses, the use of eye drops, Vitamin A therapy, and preexisting eye diseases. Several studies have shown that contact lens users are more likely to experience dry eye symptoms than nonwearers.,, Furthermore, it is well established that prolonged contact lens wear can lead to tear film hyperosmolarity and ocular surface inflammation. Therefore, it was not surprising that significant associations were observed between DED and contact lens users. Another risk factor which was found to be positively associated with DED was the use of eye drops. This could be attributed to the toxic effects of preservative-containing solutions following long-term use. For instance, benzalkonium chloride, the most commonly used preservative in eye drops, has been shown to have cytotoxic effects resulting in tear film disruption. As with all cross-sectional studies, ours has limitations that need to be considered when interpreting the study results. This study relied solely on the OSDI questionnaire to assess DED, which is a self-diagnostic method. We propose incorporating clinical ophthalmological examinations alongside the questionnaires to confirm the diagnosis of DED. Furthermore, we did not evaluate the role environmental factors played in DED, which are known to profoundly influence the disease. With these limitations in mind, this study is the first cross-sectional study to evaluate the relationship between DED and smartphone addiction in Saudi Arabia. Despite no significant correlation with smartphone addiction, DED was found to be associated with the use of contact lenses, Vitamin A therapy, and eye drops. Contrary to what was locally reported, DED had a lower prevalence. Several risk factors and clinical predictors of DED might exist, which highlight the importance of performing a complete clinical ophthalmological assessment when diagnosing DED. Dry eye disease is a common ophthalmological disease with many clinical predictors. 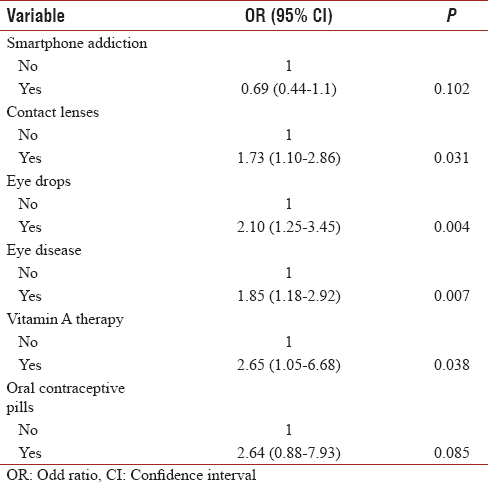 Contradictory to previous studies the prevalence was low and dry eye disease was not associated with smartphone addiction, however the use of contact lens, pre-existing eye disease, vitamin A therapy and oral contraceptive shown to be corrected. We are indebted to the following interns and medical students for their contribution in the data collection: Abdullah Hasan Ghunaim, Lina Suliman Musa, Lujain Hamid Mustafa, Bashayer Ahmed Alghamdi, Boshra Abdullah Bamalan, Rafeef Ahmed Bahafzalla, Arwa Zuhair Fatani, Raghdaa Mohammed Malebary, Ahlam Bahgat Khojah, Marwa Mohamed Abdelmoaty, Mahmoud Emadfahmi Shurrab, Ashraf Iyad AlBukhari, Hazim Abdulkarim Khatib, Anas Yahya Khayat, Rawan Abdulfattah Abdulkarim, Yousef Zaki Khedher and Shaza Omar H Alorabi. Jamal A, Temsah MH, Khan SA, Al-Eyadhy A, Koppel C, Chiang MF, et al. Mobile phone use among medical residents: A cross-sectional multicenter survey in Saudi Arabia. JMIR Mhealth Uhealth 2016;4:e61. Payne KB, Wharrad H, Watts K. Smartphone and medical related app use among medical students and junior doctors in the united kingdom (UK): A regional survey. BMC Med Inform Decis Mak 2012;12:121. Alshurafa N, Eastwood JA, Nyamathi S, Liu JJ, Xu W, Ghasemzadeh H, et al. Improving compliance in remote healthcare systems through smartphone battery optimization. IEEE J Biomed Health Inform 2015;19:57-63. Mosa AS, Yoo I, Sheets L. A systematic review of healthcare applications for smartphones. BMC Med Inform Decis Mak 2012;12:67. Xu X, Akay A, Wei H, Wang S, Pingguan-Murohy B, Erlandsson B, et al. Advances in smartphone-based point-of-care diagnostics. Proc IEEE 2015;103:236-47. Lee YS. Biological model and pharmacotherapy in internet addiction. J Korean Med Assoc 2006;49:209-14. Kim JH. Currents in internet addiction. J Korean Med Assoc 2006;49:202-8. Alosaimi FD, Alyahya H, Alshahwan H, Al Mahyijari N, Shaik SA. Smartphone addiction among university students in Riyadh, Saudi Arabia. Saudi Med J 2016;37:675-83. Mok JY, Choi SW, Kim DJ, Choi JS, Lee J, Ahn H, et al. Latent class analysis on internet and smartphone addiction in college students. Neuropsychiatr Dis Treat 2014;10:817-28. Gayton JL. Etiology, prevalence, and treatment of dry eye disease. Clin Ophthalmol 2009;3:405-12. The definition and classification of dry eye disease: Report of the definition and classification subcommittee of the international dry eye workShop (2007). Ocul Surf 2007;5:75-92. Bukhari A, Ajlan R, Alsaggaf H. Prevalence of dry eye in the normal population in Jeddah, Saudi Arabia. Orbit 2009;28:392-7. Galor A, Feuer W, Lee DJ, Florez H, Carter D, Pouyeh B, et al. Prevalence and risk factors of dry eye syndrome in a United States veterans affairs population. Am J Ophthalmol 2011;152:377-84. Li J, Zheng K, Deng Z, Zheng J, Ma H, Sun L, et al. Prevalence and risk factors of dry eye disease among a hospital-based population in Southeast China. Eye Contact Lens 2015;41:44-50. Alves M, Novaes P, Morraye Mde A, Reinach PS, Rocha EM. Is dry eye an environmental disease? Arq Bras Oftalmol 2014;77:193-200. Kim J, Hwang Y, Kang S, Kim M, Kim TS, Kim J, et al. Association between exposure to smartphones and ocular health in adolescents. Ophthalmic Epidemiol 2016;23:269-76. Moon JH, Kim KW, Moon NJ. Smartphone use is a risk factor for pediatric dry eye disease according to region and age: A case control study. BMC Ophthalmol 2016;16:188. Kwon M, Kim DJ, Cho H, Yang S. The smartphone addiction scale: Development and validation of a short version for adolescents. PLoS One 2013;8:e83558. Schiffman RM, Christianson MD, Jacobsen G, Hirsch JD, Reis BL. Reliability and validity of the ocular surface disease index. Arch Ophthalmol 2000;118:615-21. Balik HH, Turgut-Balik D, Balikci K, Ozcan IC. Some ocular symptoms and sensations experienced by long term users of mobile phones. Pathol Biol (Paris) 2005;53:88-91. Küçer N. Some ocular symptoms experienced by users of mobile phones. Electromagn Biol Med 2008;27:205-9. Nichols JJ, Sinnott LT. Tear film, contact lens, and patient-related factors associated with contact lens-related dry eye. Invest Ophthalmol Vis Sci 2006;47:1319-28. Nichols JJ, Ziegler C, Mitchell GL, Nichols KK. Self-reported dry eye disease across refractive modalities. Invest Ophthalmol Vis Sci 2005;46:1911-4. Baudouin C. A new approach for better comprehension of diseases of the ocular surface. J Fr Ophtalmol 2007;30:239-46. Fraunfelder FT, Fraunfelder FW, Edwards R. Ocular side effects possibly associated with isotretinoin usage. Am J Ophthalmol 2001;132:299-305. Mamede AC, Tavares SD, Abrantes AM, Trindade J, Maia JM, Botelho MF, et al. The role of vitamins in cancer: A review. Nutr Cancer 2011;63:479-94. Samarawickrama C, Chew S, Watson S. Retinoic acid and the ocular surface. Surv Ophthalmol 2015;60:183-95. Moy A, McNamara NA, Lin MC. Effects of isotretinoin on meibomian glands. Optom Vis Sci 2015;92:925-30. Clouzeau C, Godefroy D, Riancho L, Rostène W, Baudouin C, Brignole-Baudouin F, et al. Hyperosmolarity potentiates toxic effects of benzalkonium chloride on conjunctival epithelial cells in vitro. Mol Vis 2012;18:851-63.